Brian Yaeger is the author of Red, White, and Brew: An American Beer Odyssey (St. Martin’s) and Oregon Breweries (Stackpole) and contributed to the Oxford Companion to Beer. He teaches UCSB’s first-ever beer education class. His thirst for beer knowledge dates back to before the modern Cicerone era and though there are now over 100,000 Cicerone Certified Beer Servers, his certificate is #931. 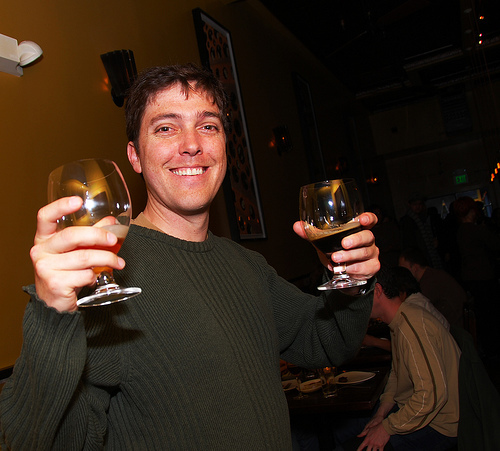 He is frequently published by CraftBeer.com and other national and local publications (and was a regular in BeerAdvocate, All About Beer, Draft, and Beer Connoisseur) including his local alt-weekly, the Santa Barbara Independent. He is currently writing a doughnut book! That’s because, among his niche-market beer festivals that he organizes, the one called Baker’s Dozen features breweries, coffee roasters, and doughnut shops. Other journalistic pursuits of passion include food, travel, and music. Yaeger has appeared on NPR’s Marketplace with Kai Ryssdal, Martha Stewart Living Radio, and The Brewing Network. He earned a Master in Professional Writing (with a thesis on beer) from the University of Southern California. He lives in a postcard in Santa Barbara along with his wife Half Pint, son IPYae, and dogs Dunkel & Taz. Follow him on Instagram at @BrianYaeger or Twitter at @Yaeger. Follow him too closely on the freeway and he’ll slow down. If you were a Smurf, who would you be?